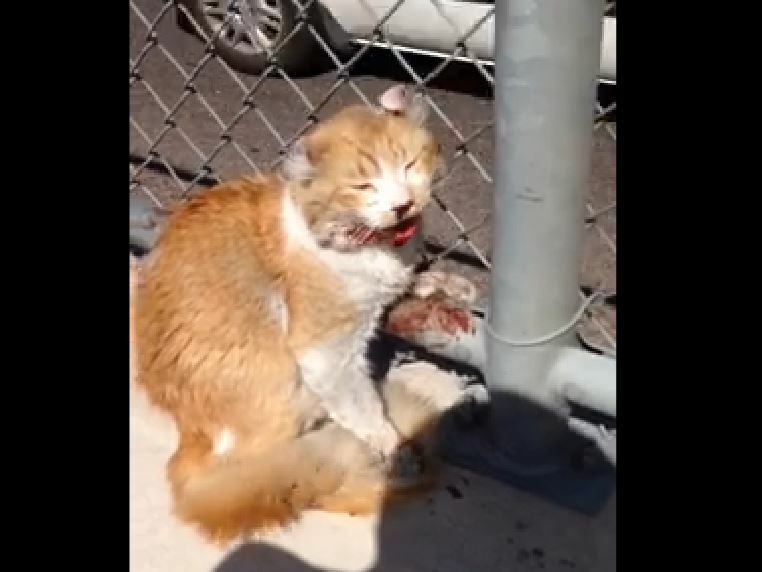 Good Samaritan Richard Christianson rescued an injured and desperately upset cat from a Tucson, AZ freeway last week and told the story when posting a video of the rescue online. Good Samaritan Richard Christianson rescued an injured and desperately scared and upset cat from a Tucson, AZ freeway last week and told the story when posting a video of the rescue online. Richard saved the 2 year old kitty, now named Freeway, from a narrow median strip on I-17 in Tucson on April 9th, where the distraught feline was desperately clawing at a chain link fence. Richard stepped in after calls to the highway department did not bring help in a timely fashion. One commenter at the Arizona Humane Society’s Facebook page suggested that the cat had been crying for help for hours before the rescue. Richard tells the kitty, ” I know, baby. I know you’re scared, dehydrated, I know. Can I help you?” as he approaches him to make the rescue, and Freeway continues to meow, asking for help. Richard wrapped kitty in a tee shirt and carried him to his car. Richard took Freeway to the Arizona Humane Society‘s Sunnyslope Campus in Phoenix, where he had surgery on his jaw and his paws. He is recovering from his traumatic experience in foster care and will be put up for adoption when he is ready. Based on burns on his front legs, AHS thinks Freeway may have been stuck in a car engine before ending up on the busy road. 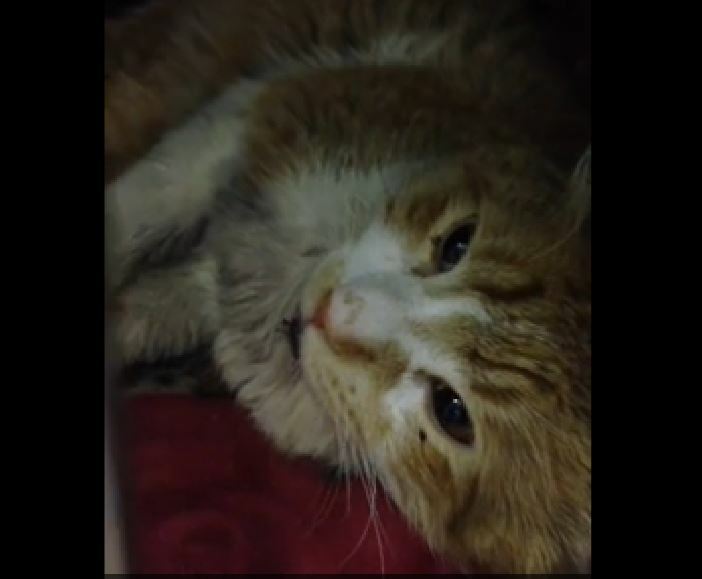 Richard posted his video and rescue story at the Facebook page of a group dedicated to helping strays. HERO! You cared, you stopped, you took the time, you didn’t turn away, you made all the difference! thank you for helping this boy! Thank you so much for saving Freeway. You are a hero. Wish the world had more like you. Animal deserve better treatment than they get from most humans. I have over 31 cats I struggle to feed and sometimes I go hungry to feed them. And I will always put them first. I hope freeway finds a great home. Thank you again for helping him. Sylvia, I hope you reach out to your local private rescue groups, or even the public ones. There are pet food banks that may be able to assist you with obtaining food for your cats. There is a community of people who want to HELP people who help cats, so maybe you won’t have to go hungry for them. Consider it, please. You are indeed a hero ,and a very brave one. Thank you for your bravery, and for your big heart . I cannot stand it when animals are hurt. Richard might not consider himself a hero, but ask Freeway how he feels. We lived in Tucson almost 20 years, and 17 is a very busy road. How many people saw this poor injured cat and just kept on going. Richard Christianson certainly IS a HERO! And our world needs more people like him.